Test Level: A specific instantiation of a test process. 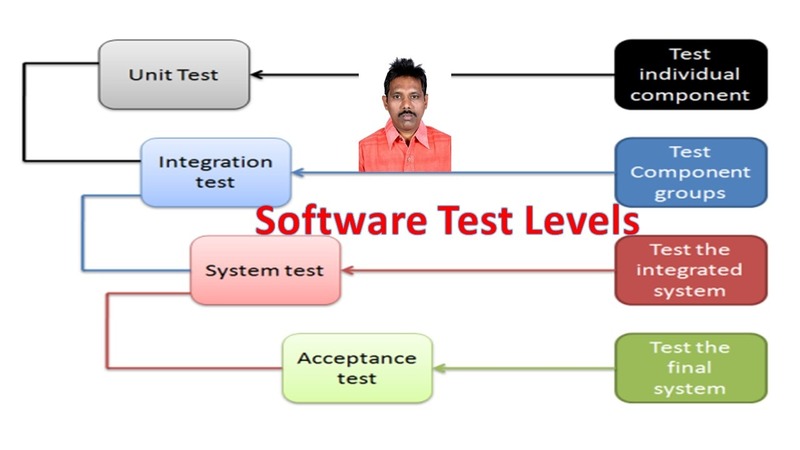 Software Test Levels are the different stages of the software development life cycle where testing is conducted. In order to increase the Quality of Software we go for multiple levels of Testing instead of conducting single stage of Testing. Test Levels identify missing areas and prevent overlap and repetition. The most basic type of Testing is Unit or Component Testing, Unit Testing is a level of software testing where individual units/ components of a software are tested and the purpose of Unit Testing is to validate that each unit of the software performs as designed. Unit or Component Testing may include Testing of Functionality and specific Non Functional characteristics such as resource-behavior (Ex: Memory leaks), performance or robustness testing, as well as structural testing (ex: Decision Coverage). Test cases are derived from Software Design or the data model. It is normally performed by software developers using the White Box Testing method, in rare cases, it may also be performed by independent software testers. Integration Testing tests interfaces between components, interactions to different parts of a system such as an operating system, file system and hardware or interfaces between systems. Integration Testing is often carried out by the integrator, but preferably by a specific integration tester or test team. Test drivers and test stubs are used to assist in Integration Testing. Integration Testing can be conducted in two states for some applications, component integration testing after Unit Testing and system integration testing after system testing. System Integration Testing: Testing the integration of systems and packages; testing interfaces to external organizations. System Testing should investigate both functional and non functional requirements of the system and testers may also deal with incomplete or undocumented requirements. System Testing requires a controlled Test Environment as well as stable software build/s and the test environment should correspond to the production environment as much as possible in order to minimize the risks. Normally Independent Testers perform System Testing using Black Box Testing Method. Acceptance Testing is a level of software testing where a system is tested for acceptability. The purpose of this test is to evaluate the system’s compliance with the business requirements and assess whether it is acceptable for delivery. Acceptance test has two stages, first one is Alpha testing, this test takes place at developer’s site, A cross section of potential users and members of the developer’s organization are invited to use the system. Developers observe the users and note problems. Next Beta Testing or field testing, sends the system to a cross-section of users who install it and use it under real-world working conditions.